It’s the beginning of my second week living in Dublin. The move is complete, most of the admin has been sorted and the other half has gone back to work, so naturally it is time for me to get back to the theatre. It’s been harder than I expected to find out what’s on in Dublin – the Theatre Festival is on at the moment, and I’m scanning through the programme for something that may take my fancy, but my lack of knowledge of the locations of the theatres,where to get good deals and the new phenomenon of having to book ahead (along with the loss of my usual theatrical companions and conspirators) has slightly put the brakes on. I do hope to be back up to speed soon, so please bear with me and send along any tips that you may have. Bewley’s, however, is the perfect spot for the wandering theatregoer with some mid-week time to kill. Nestled on the second floor above a bustling cafe, slap bang in the middle of the busy Grafton Street, it is accessible without losing that slightly smug-making feeling that you’ve uncovered yourself a little gem. It’s lunchtime theatre (some shows have evening performances) from Monday to Saturday and the basic ticket is €8 on a Monday, with an additional €4 for some very tasty homemade soup and soda bread. Perfect. The play itself was charming – a 50 minute monologue adapted from the work of the comic writer variously known as Brian O’Nolan, Flann O’Brien and Myles na gCopaleen (no typo there – I promise!). It is a mischevious and light hearted telling of the despair of one man constantly having to take responsibility after the actions of his errant sibling. It was enjoyable enough, but definitely made me feel my ignorance as a Brit abroad – the adaptor’s note mentioned the ‘in-jokes’ and many of the (mainly older) audience members around me were in hysterics, but something for me didn’t quite connect. As the sole performer, Aidan Jordan was loveable, with good comic timing, but the gentle humour possibly won’t quite hit the spot for those without the background knowledge of O’Brien’s works or 1940s Dublin. A one man show was possibly a bit of an ambitious choice to get me into Irish theatre, but I’m hoping to become more au fait in the months ahead – Bewley’s is certainly a recommended spot, I hope to be back as much as the new job will allow. In a lovely end to the afternoon, I was thanked for coming along by a very friendly, bright eyed gentleman as I left. He seemed familiar so I went back to peruse my programme and saw that he was non other than Val O’Donnell, who adapted the show. Now that’s a touch you wouldn’t get in London. 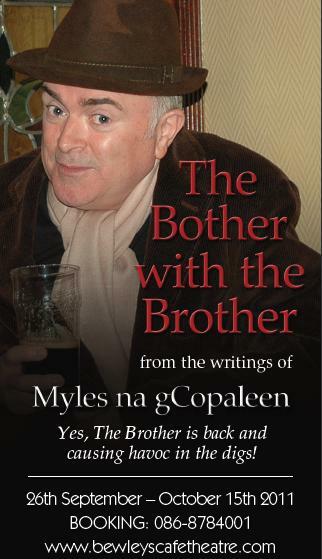 The Bother with the Brother is on at Bewley’s Cafe Theatre, Grafton Street until 15th October 2011. Tickets are €8 for Monday, €10 Weds-Thurs and €12 Friday-Sat. An extra €4 will add lunch to the price. To book tickets, click here.